Fall is almost here, so it’s the right time to prepare for this season. If you wanna create chic and elegant looks, then this theme of an article will be perfect for you. 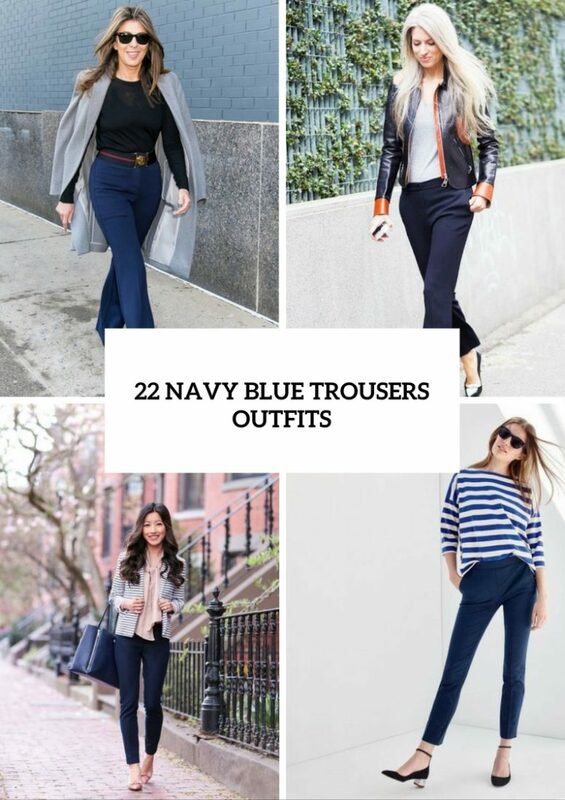 Today we’ll talk about navy blue pants, I think that this piece of clothes is one of the basic ones for anybody’s wardrobe. So if you haven’t them yet, choose and buy them urgently. 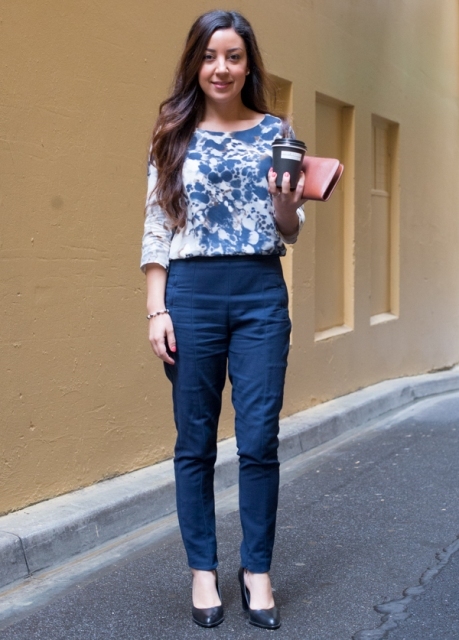 First, pick up trousers depending on your body shape, occasions and your personal style. 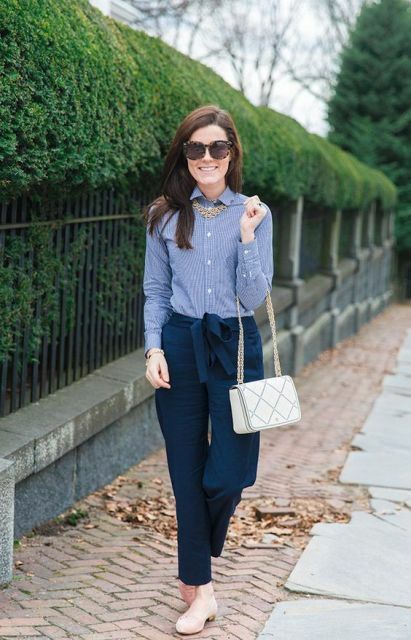 For example, for office looks choose straight or skinnies, for casual looks you can find cool cuffed ones or culottes (remember that they can make you to look shorter visually so always add heels or classic pumps to these looks). Now let’s find out with what pieces of clothes and what colors navy blue pants will ideally match. 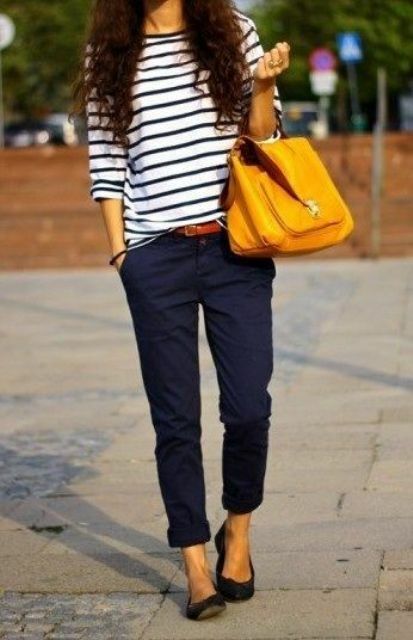 Of course, white shirt and navy trousers will be great clothes combination, so you can pair classic button down shirt (it can be printed one, for example, with stripes) with navy blue pants, neutral shoes and big bag for the traditional office looks (you can also add a jacket in the same color palette). You can also change simple white shirt to any pastel color ones and boldly add some printed shoes to create a funny and more interesting look. 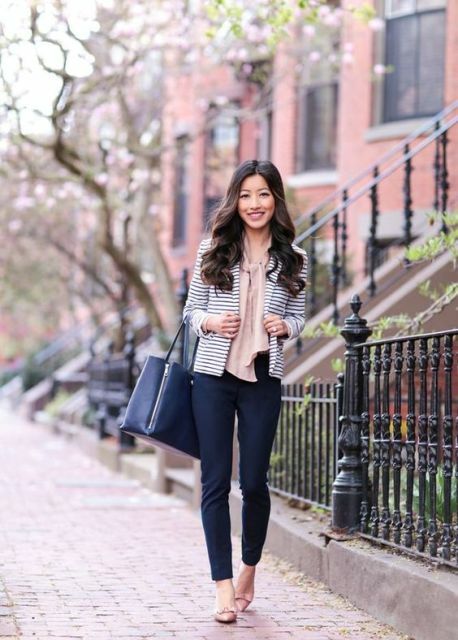 You should know that these trousers look good with coral and light pink colors, so if you have a creative job (or don’t have a strict dress code), combine these pants with coral or blush pink jacket or top. And finally I need to warn you: don’t try to mix navy blue color trousers with a lot of black, dark purple or dark blue things. Now look below and find more cool ideas that you can repeat. Get inspired and enjoy!